I started blogging on Blogspot.com last September 2009. And from then on, the number of blogs I posted grew and the number of people I met and became friends with grew too. I can say that it's been very fruitful blogging year for me. I've attended a lot of great events, cool parties, met a lot of nice people - including celebrities - and I've been to a lot of different places. And with that, one of the highlights of all of these things is the Baguio Trip that I had with my blogger-friends. This was my first time to go out of town for 2 days with my blogger-friends, and I really, really enjoyed everything we had there. If there are things that I'll treasure from my 2010, this event is definitely one of them. Thanks to the owners of Mines View Park Hotel, to Azrael for organizing this event and inviting us and to Miss Judy who loves bloggers so much! My 2010 blogging life wouldn't be as happy as it was without you great blogging friends, so thank you so much! 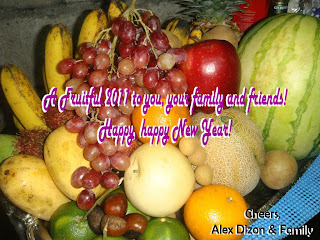 May we all have a fruitful year ahead! Cheers!